#Spaulf: Stephen Sodheim once wrote a song entitled "Send in the clowns". Don't bother, they're here. protest in groups of 50 or less as long as you obey the rules. 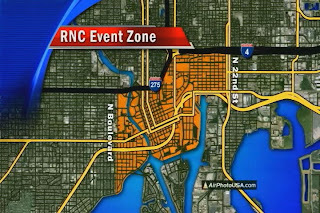 Tampa has hosted four Super Bowls, but the protesters expected to cram into the city for the Republican National Convention will be a different sort of crowd, and the police are trying to be ready. In 2008, thousands of protesters arrived in St. Paul, Minn., for the RNC. Some smashed cars, punctured tires and threw bottles in a confrontation with pepper-spray wielding police. Hundreds were arrested over a few days, including dozens of journalists. "Minneapolis surprised everyone," said Rod Reder, a retired Hillsborough County sheriff's captain who worked three Super Bowls in Tampa and the Free Trade Area of the Americas protests in Miami in 2003. Congress has given Tampa — and Charlotte, the location of the Democratic National Convention — $50 million each in taxpayer money to try to ensure everyone is safe for the political gatherings that crown each party's presidential candidate every four years. Tampa police have spent about $13.6 million so far on big-ticket security items, including 200 bicycles, 13 electric all-terrain vehicles and one armored truck for the Aug. 27-31 Republican gathering. However, authorities are not revealing much more about the purchases and other expenditures. The Associated Press sent Tampa Police a public records request asking for copies of the purchase orders and bids of everything the department is buying for the convention. The Secret Service contends that the information is exempt from public scrutiny due to homeland security concerns and officials say the request is under review. For more than a year, a phalanx of federal, state and local agencies have met to discuss convention security plans. Protest zones and parade routes have been created for those — perhaps in the tens of thousands — wishing to express their opinions. "We've extensively studied St. Paul," said Tampa City Attorney Jim Shimberg. "We've had meetings with folks in St. Paul, to find out what went well and what went wrong." Ordinances were enacted banning water guns, hatchets and chains — but not firearms because that would violate a state law barring local gun regulations. And the city of Tampa will bring in more than 3,000 officers from 59 law enforcement agencies from around the state, along with Florida National Guard troops, to patrol the streets. Reder's security company is offering bodyguard services to VIPs and politicians. He said he's not concerned about protesters, many of whom are from labor union groups or organizations like the American Civil Liberties Union. His worry is anarchists who believe government should be abolished. "This is not a Super Bowl crowd," he said. "Big difference. Tampa's never seen anything like this." Tampa Police Chief Jane Castor said that also is her concern. Anarchists caused property damage and mayhem in St. Paul, she said. "We believe the vast majority of individuals that come for the RNC will do so peacefully," she said "We're not naive enough to think there won't be a small contingent bent on disruption, though." 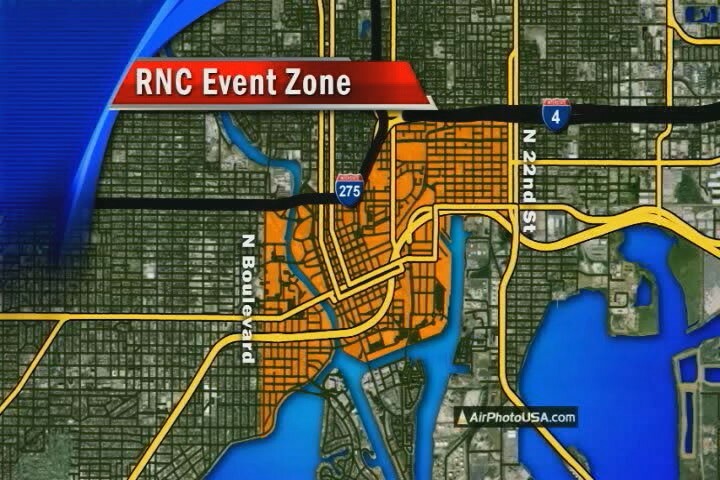 The official line from RNC organizers and local police: everything will be OK.
"We feel very confident with the local officers as well as the Secret Service that we will have a successful convention," said RNC spokesman James Davis. Tampa police have already bought seven Segways, 1,765 handheld radios, 163 vehicle-mounted radios, helmets, face shields and body armor. The radios have so far been the biggest purchase, at $6 million. "It's a huge team undertaking," said George Ogilvie, the spokesman for the Secret Service, the lead agency for convention security. AP has filed a similar request for expenditures in Charlotte, where police say some of money will used to upgrade and buy new equipment to help protect the city during the Democrats' three-day convention, which begins Sept. 4 at Time Warner Arena. President Barack Obama's acceptance speech has been moved to the 74,000 seat outdoor Bank of America Stadium. Charlotte has refused to release details about what it's buying with the federal money, including bid documents and purchase invoices. So far, the city has released three pages showing how some of the money has been spent. About $1.7 million was used to upgrade space in its command center, and more than $131,000 was allocated to help expand and equip the department's motorcycle unit. Scrutinizing past conventions also should help so officials can see how protesters and crowds behaved. The most famous disruption was probably in 1968 for the Democratic National Convention in Chicago. Scenes of police clashing with protesters on the streets played on TV screens in living rooms across America. Four years later, anti-war demonstrators disrupted the RNC in Miami Beach — the last time a political convention was held in Florida. Conventions were mostly peaceful until St. Paul. After that event, officials wrote an 82-page report. "In many respects, Saint Paul city and police officials were successful ... During the four days of the convention, no one was seriously injured and there was limited property damage," wrote a commission tasked with summarizing the event. "But not everything went as planned and not all expectations were met." The report cites several glitches in St. Paul, which at the time was the smallest city to host a convention, including a security fence erected by the Secret Service that made it difficult for convention participants, law enforcement and others to easily move around the downtown area. It said law enforcement was "taken by surprise" when several hundred anarchists arrived in the city. Reder said that both Tampa Police and the Hillsborough County Sheriff's Office — which is the other large law enforcement agency in the region — have longtime veterans overseeing the tactical plans. Water also can be an obstacle, Reder said. The convention will be held at the Tampa Bay Times Forum, a building that is backed by a river, which winds through downtown — which means it will be more difficult for officers to push protesters out of the area if needed. "If a crowd gets out of control, it becomes a danger," he said. Shimberg said that organizers of parades or marches must sign up with the city to use the route, and are slotted in 90-minute increments. But as of July 6, only three groups have signed up. Shimberg said he's surprised more groups haven't come forward, and doesn't know what the low numbers signify. There's no deadline to sign up for the parade route, but he said there are 28 open slots during the four-day convention. "We're a little baffled," he said. "I'm not sure if it means that people don't want to go where we want them to go, or if they're just not coming."